Clip-on lenses can bring a whole new range of photography options to your iOS or Android smartphone, including macro lenses for close-ups, telephoto lens for up to 22x optical zoom, and fisheye lens for giving your photos a unique look. As we all know, smartphone cameras have improved leaps and bounds in recent years, to the point that todays flagships - like the iPhone XS and Google Pixel 3 – are on par with some dedicated cameras. But, while the image sensors and processor – especially Google’s AI-powered photo smarts – produce some stunning results, the inherent thinness of a smartphone’s body means lens options are limited. Some manufacturers have countered this by adding a second, third or even fourth lens to their phone camera systems, bringing 2X optical zoom, wide-angle photography and bokeh-style blurred images into the fray. But these solutions only go so far. For more functionality – greater magnification, wider angles, macro capabilities and more – you’ll need to buy additional lenses. Some of these lenses are made for a specific model of smartphone, while others are universal, clamping to most phones in a way which sits the lens neatly over that of the phone itself. As you will see, prices can vary massively depending on the manufacturer. Olloclip is considered the market leader (along with Moment and ExoLens, which are only available in the US for now), and their prices are considerably higher than most others. But, as with lenses for ‘proper’ cameras, there is an argument that you get what you pay for. That said, over £100/$100 on a gadget for your smartphone may seem steep, whereas £20/$20 or even less could be money well spent on a lens which, while unlikely to produces images for National Geographic, makes for a fun, simple accessory. Olloclip is one of the market leaders when it comes to smartphone camera lenses, and as a result Multi-Device 3-in-1 is pricier than most other options on this list. But try not to let that put you off, as these are high-quality lenses and mounts which could be worth in the investment if you use them a lot. This particular set is designed to fit to almost any smartphone by clipping to it. Of course, this means the clip obscuring part of the display, but this shouldn’t be too much of an issue for most users. The set comes with 15x macro, fisheye, and super-wide lenses, giving you a broad range of options for extending your phone camera’s capabilities. Moment produces a small range of high-quality, award-winning lenses for smartphones. Unlike most other options, these do not clip to the phone; instead, they attach to a case which is designed specifically for a range of smartphones from Apple, Google and Samsung. As such, this means they fit securely but require you to purchase a new case to fit the lens to your phone. Moment lenses cannot be bought on the high street in the UK, but can be shipped over from the US via Amazon, which charges an extra $29 for the privilege, putting the total for this lens up to almost $150, plus the $35 case and any import taxes you may have to pay. A highly regarded phone camera lens which has reviewed well and is sensibly priced, this offering by Aukey looks the business and attaches uses a spring-loaded clip. A 120-degree wide angle lens is included along with a 15x macro lens. The only real downside here is that, due to a snug fit, the lens isn’t suitable for smartphones which have two rear cameras, like the iPhone X and Samsung Galaxy S9. That may be okay for some reader – we know consumers are now holding onto their smartphones for longer than ever – but it could be an issue for those who demand the newest handset every year. The clip is made from soft rubber so it shouldn’t leave any marks or scratches on the screen of your smartphone. Where most universal lens kits fit to phones with large clips, this solution from Nelomo employs a rubber-ended screw. 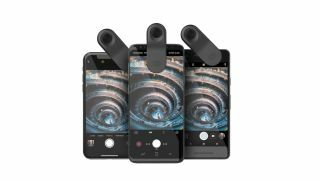 This means the lens mount can clamp to phones measuring between 7mm and 10mm thick, which caters for most recent handsets including the iPhone 8 and X, the Samsung Galaxy S9, and the Google Pixel 3. The kit comes with three lenses, including a wide 230-degree fisheye, a ‘super wide angle’ lens, and a macro lens which offers the equivalent of a 15X zoom. There’s also a microfibre cleaning cloth and bag, plus a protective carry case and hook for clipping it to your backpack. The only drawback here is how the lens mount might not clamp around your phone if it’s already wearing a thick case, given the 10mm thickness limit. Perhaps the ultimate kit for any smartphone photographer, this bundle includes macro, 2x telephoto, fisheye, super-wide and ‘ultra-wide’ lenses, which cover most circumstances. The protective carry case also includes Olloclip’s universal clip system for fitting lenses to almost any recent smartphone, and a grip mount for securing holding your smartphone while shooting landscape video. This kit can also be purchased with dedicated lens mounts designed for the iPhone X, XS, XS Max, XR, and the iPhone 7, 7 Plus, 8 and 8 Plus. It’s not cheap, but if you’re looking for the complete package this could well be it. This three-lens set by Jopree includes a 15x macro (as many of the sets featured here do), plus a 120-degree wide angle lens and a 180-degree fisheye. The latter isn’t as broad as some other fisheyes outlined in this article (extending to 230 degrees), but if you are wanting a more subtle effect to your photos then this could be a good option for you. As with most options here, the Jopree uses a spring-loaded clamp to hold the lens over the amera of your smartphone or tablet, and it should fit over the front-facing camera of most devices too, for artistic selfies. Each lens screws into place and the kit come with a cleaning cloth, a protective container for each lens, and a carry case for keeping everything together. This three-lens kit represents excellent value for money, as under £10. For that you get a fisheye lens, macro lens and wide-angle lens. Conveniently, the lenses screw over the top of each other, making it quick and easy to switch between one and the other. You’ll want to make sure you keep these lenses clean and scratch-free though, as when using the wind lens you’ll actually be shooting through both that and the macro lens underneath. The kit comes with a carry pouch and the clip mechanism means the lens mount should fit most smartphones and tablets. You could even fit it to the webcam above the screen of your laptop if you’re ever feeling creative during a Skype chat. Another option from Olloclip, this lens kit is designed specifically for the new iPhone XR. However, it is worth point out that Olloclip also sells lenses for the iPhone XS, X, 8, 7 and SE, plus a universal range which fits to most smartphones. This iPhone XR kit comes with comes with three macro lenses offering magnification of 7x, 14x and 21x - the latter being more like a microscope than anything you will have seen from a smartphone before. The lenses come with a clip specifically made for the iPhone XR, into which other Olloclip lenses can be attached. That way, when you upgrade your phone you just need to buy the clip for that phone then continue using the lenses you already own. Going a step further than the previous kit, this Bamoer kit boasts a telephoto lens with a 22x zoom, plus a miniature tripod for keeping your phone steady, a Bluetooth shutter controller, and three extra lenses. These three include wide-angle, macro and a fisheye, with the first two screwing into each other for each storage. There are also lens caps for protecting the glass, a cleaning cloth, two soft storage pouches and a hard case to keep everything safe. While it may be tempting to always go for the telephoto lens with the largest magnification, you should also bear in mind how you’ll go about taking such zoomed-in photos. Your hands will likely shake too much, so the included tripod is crucial, and you may even want to invest in a more substantial alternative - which is possible, given the telephoto lens’ universal screw mount. This eight-piece lens and filter kit from Apexel offers a great range of photographic accessories for very little money. There’s an 18x telephoto lens with manual focusing and a tripod to keep it stable, plus the usual collection of a 15x macro lens, wide angle lens, and a 198-degree fisheye. As well as these, the kit comes with a star filter for creating lens flare when pointed at bright objects like lightbulbs, and a kaleidoscope lens for adding a new spin to your photos. A Bluetooth shutter remote is also included, along with a cleaning cloth and the same click-style attachment as used by other kits, meaning the lenses will attach to most smartphones and tablets.